Paul Sheerin is the new player-manager at Abroath, having agreed a one-year deal at Gayfield. The 35-year-old, who was released by St Johnstone at the end of this season, replaces Jim Weir, who left to take over at Brechin City. The midfielder can also count Alloa, Inverness, Ayr United and Aberdeen among his former clubs. 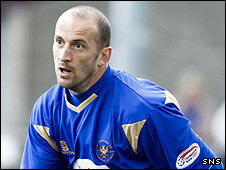 Sheerin moved to St Johnstone six years ago but only made 14 appearances for the Perth club this season.